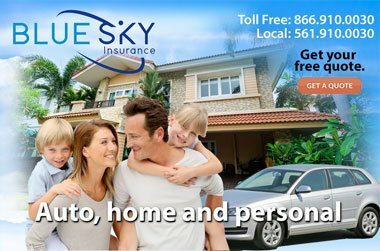 Blue Sky Insurance agencies in Boca Raton and Florida. 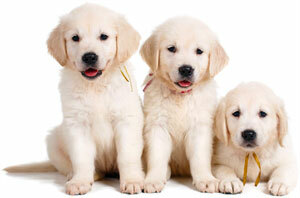 group benefits, commercial and business policies and quotes. 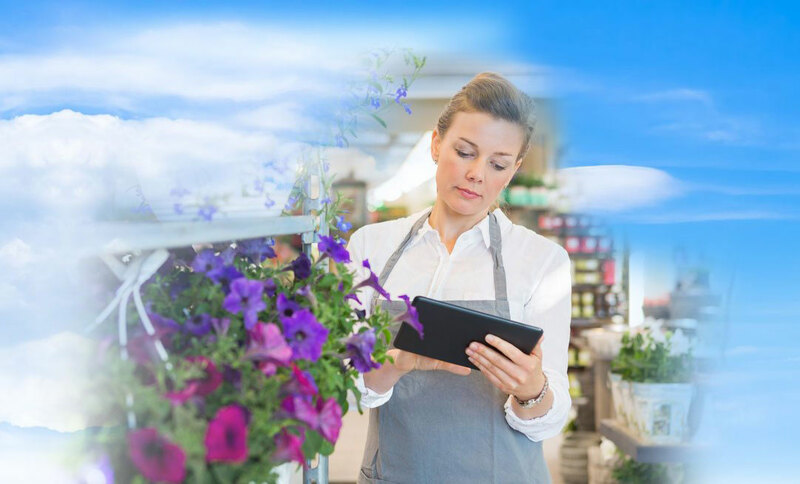 Blue Sky, a Florida insurance agency insures personal, business and commercial properties and assets. Our insurance agencies have served residents and business owners for over 15 years. Our home office is located in East Boca Raton. 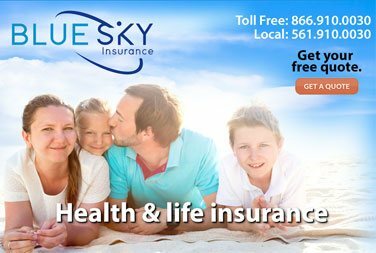 Blue Sky Insurance® is a Florida licensed, full-service insurance agency in Boca Raton, Florida. Our independent agents and brokers and agencies throughout the state of Florida offer the sale and service of home insurance, auto insurance, personal life & health insurance, financials, business and commercial insurance products including commercial property, commercial auto, employee benefits / Florida group benefits and Florida workers compensation insurance. 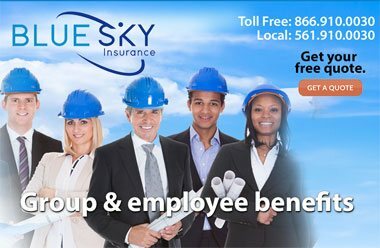 Blue Sky Insurance® and its agent and broker staff are in business because of our clients, the community we work in and our team. That philosophy is why we have an atmosphere of excellence and a heart of service. 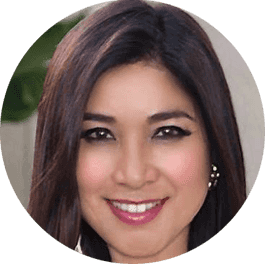 We aim to truly get to know our clients and provide insightful insurance policy knowledge and a provide a wide variety of insurance and investment products that cater to each individual’s needs. 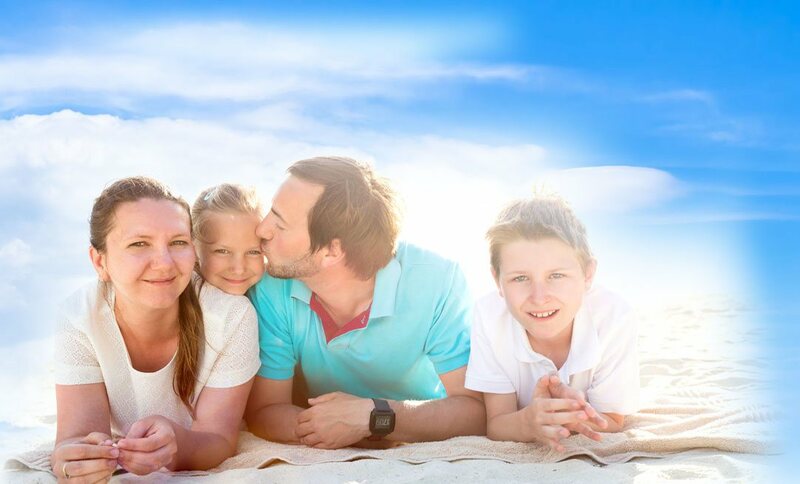 We are an active member of, and take pride in our Palm Beach County community and are pleased to provide outstanding service and insurance policies for Boca Raton residents as well as our clients around the state of Florida. Our agency represents over 70 insurance carriers to provide our clients with the best options for coverage with the most reliable carrers. Serve our Clients with integrity. Serve our Community with heart. Serve our Team with gratitude. 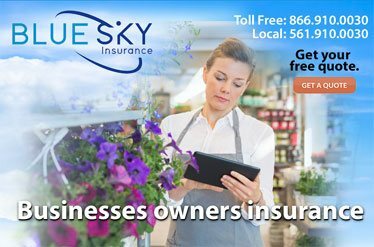 Blue Sky Insurance® agency is located in the heart of Boca Raton, Florida in Mizner Park. We take pride in the loyalty our customers have shown throughout our 15 years of service. Our continuous stream of referrals from South Florida and throughout the state of Florida confirms our commitment to excellence, our quality tailored policies and the integrity our insurance agency is built on. Our rates are highly competitive, and we offer outstanding quality protection with low cost permiums. Our ability to represent a broad selection of top rated, top tier insurance carriers assures that we can place the coverage you need. We appreciate your business and look forward to helping you secure your personal assets as well as your business.